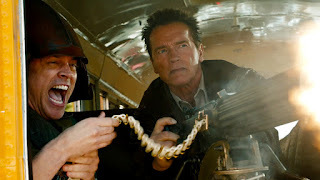 Arnold Schwarzenegger's post-politics big screen comeback kicks off with The Last Stand, a ridiculously fun B-movie running on surplus adrenaline. In an audacious escape during a prisoner transfer in Las Vegas, drug lord Gabriel Cortez (Eduaro Noriega) is freed from the clutches of FBI Agent John Bannister (Forest Whitaker). Cortez takes Agent Ellen Richards (Génesis Rodríguez) hostage and using a souped-up Chevrolet Corvette speeds towards the border with Mexico. Meanwhile his heavily armed goons under the leadership of Thomas Burrell (Peter Stormare) are constructing a bridge over a narrow ravine near the dusty town of Sommerton Junction, Arizona. Cortez blows through every barricade and check point that Bannister throws in his way along the desert highway. The only thing standing between Cortez and ill-gained freedom is Ray Owens (Schwarzenegger), the grizzled Sheriff of Sommerton. A former Los Angeles police force drug enforcement agent, Owens moved to Sommerton in search of a quiet life as he fades into retirement. His deputies Mike (Luis Guzmán), Sarah (Jaimie Alexander) and Jerry (Zach Gilford) are inexperienced and generally inept. Outgunned and outnumbered, Owens nevertheless decides to make a stand to stop Cortez, with the help of eccentric local gun collector Lewis Dinkum (Johnny Knoxville) and bad boy Frank Martinez (Rodrigo Santoro). A cross between Rio Bravo, The Fast And The Furious and a Roadrunner cartoon, The Last Stand is a slick exercise in mindlessly clever action. Directed by Kim Jee-woon with an eye for sly style, the film pops with vivid colours, loud noise, over-the-top violence and quite a bit of wicked humour. Amidst the calculated mayhem, The Last Stand also manages to throw in some lines of satire and wry observations. Owens is an immigrant seeking rustic calm, and he personally resents Cortez for giving immigrants a bad name. There are references to the craziness of Los Angeles, and a wink towards the carnage about to be unleashed on a sleepy border town. Kim injects copious amounts of local flavour, and the secondary characters populating Sommerton provide an animated backdrop fuelled by dry humour. But this is a film all about action, and Kim does not disappoint. Once the guns start firing in earnest they really don't stop, and the final 30 minutes feature a sublime battle followed by an old-fashioned man-to-man showdown. The havoc is filmed with almost balletic artistry, Kim demonstrating an eye for cohesive composition and eloquent scene construction. Before the climactic gun battle, Cortez provides all the kinetic energy as he speeds along the highway in a missile of car. The driving scenes are exquisite, capturing unbridled speeds generated by a monstrous engine and sleek aerodynamics along the open road. Despite all the gloss, The Last Stand never threatens to be anything other than implausible. The story is contrived and shallow, the acting stiff, and the characters lack any semblance of depth. But none of that matters; in many ways this is a throwback to the earliest Arnold movies, when brawn ruled and brains stayed outside the theatre. The man may be much older, but he can still haul around the biggest available machine gun.